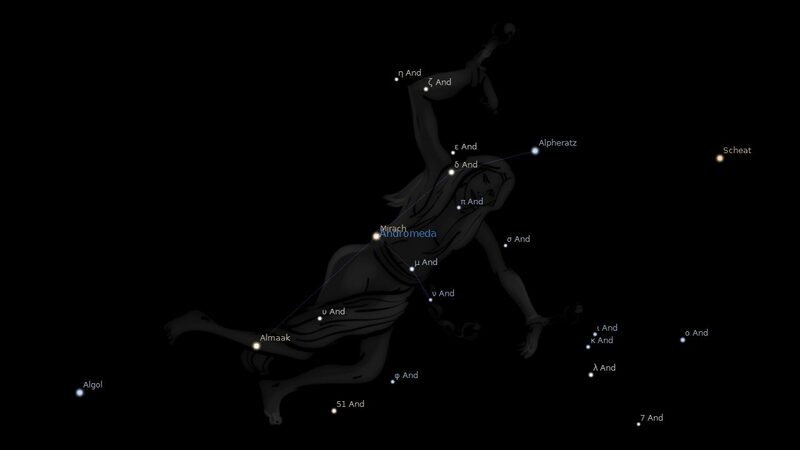 Fixed star Almach, Gamma Andromedae, is a 2.3 magnitude quadruple star system in the foot of the Chained Woman, Andromeda Constellation. However, it appears to stargazers to be a beautiful double star with a striking contrast of color, a bright, golden yellow star next to a dimmer, indigo blue star. The traditional name Almach is derived from the Arabic العناق الأرض (al-‘anāq al-’arđ̧) which means the caracal (desert lynx). Another term for this star used by medieval astronomers writing in Arabic was آلرجل المسلسلة (Al Rijl al Musalsalah) which means the Woman’s Foot. 1. Fixed Stars and Constellations in Astrology, Vivian E. Robson, 1923, p.26, 128. 2. Fixed Stars and Judicial Astrology, George Noonan, 1990, p.30. 3. Fixed Stars and Their Interpretation, Elsbeth Ebertin, 1971, p.11. 5. The Fixed Star Health and Behavior Imbalance, Ted George and Barbara Parker, 1985, p.19.